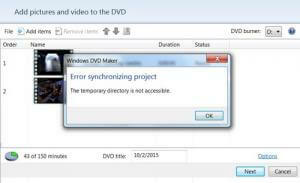 ForumWindows 7 Operating SystemWindows DVD Maker Error? I have used the Windows DVD Maker [ I'm running Windows 7] on a few different occasions and it always worked well. Now, all of a sudden I get a pop up window saying it cannot "sync". If some one has some advice on what the problem might be, I sure would like to hear it. Have you moved any files around since last opening this project Myles? It's possible. I am very forgetful at times. If that is what I did and is causing the problem, what should I do? I tried deleting the project I was working on and started a "new" one, but the results were the same. All the video files I use are all in the same folder. What do you mean "the results were the same" - is that after you saved the project and then went back to it? I deleted the project and started a "fresh" one but the error window popped up again. Yes, I get that Myles, but exactly when did the error window pop up, at which point? When you were trying to import files? When you clicked the "burn" button? When? Are there any audio/music files involved? The error window pops up after I add the video files and then click to go on to the next phase which would be text and then loading a music file. It loads the appropriate .avi files like it is working but that's it. What format is the music file? MP3? Well, according to reports, Windows DVD Maker does NOT support MP3, if you try to include an MP3 file, you will receive the sync error message. You need to convert the MP3 file to WMA format and then it should be okay. Please do this Myles - open Windows DVD Maker and click on Options (bottom right corner). What is shown as the "Temporary file location"? Wow! I feel like an idiot! I checked the file location like you said and it is a folder I deleted yesterday along with the WMA file that was in it, not an mp3. I am so sorry for taking up your time on this matter. Hey, no problem at all Myles. Always happy to help out. Why doesn't Windows DVD Maker support mp3?